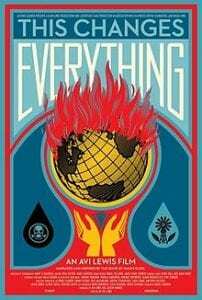 The movie “This Changes Everything” by director Avi Lewis, and its printed book’s author Naomi Klein were opening with an idea of one quote,“I’ve always kind of hated films about climate change”. She thought they were boring. She always hated films about climate changes. The author believed that unlike the human nature, stories are something we can change. During the movie, I really like how that director made the movie active and unique. The climate change caused by greedy businesses in the world is too generally. The author turns to find comfort in crisis. The movie was made in an old version which gave people a real portrait of the view of what the author really wanted to explore. It inserts many shoots of strikes, as well as real interviews with different people. After I reviewed the movie one more time, I remembered Lewis had shoots like an indigenous group in Canada rebels against toxic spills on ancestral lands and Indians use their bodies to obstruct the building of power plants… The embrace is wide that includes questions for the role of government and pollution’s beneficiaries. After all, I really like all the movie shoots that Lewis made and the idea of “hating films about the climate changes” from the author.